Westwood residents are digging out from the snowstorm that hit the region the last week of February. The problem, voiced again and again, was where to put the snow. 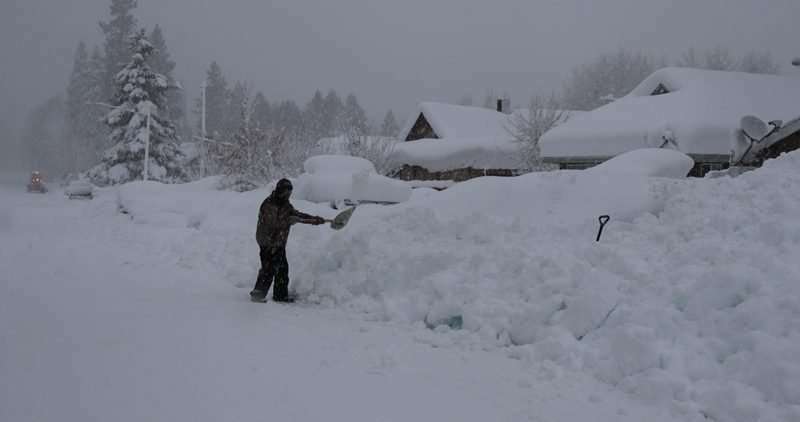 It filled yards, avalanched off the roofs of houses and buried cars parked at fence lines along the roadways. At times, entire houses seemed to be buried. Forest Duerksen, Westwood fire chief, said a crew from Antelope Camp cleared fire hydrants Wednesday, Feb. 27. Cal Fire and the Department of Corrections and Rehabilitation operate the camp eight miles east of Susanville. Also on Wednesday, the Lassen County Department of Public works began to move plows through the streets a second time that day in an effort to remove more snow from the surface of roads after rain began to soften it. Bob McGarva, road field supervisor, said the county had two new snowplow drivers this winter and they had to learn the system quickly due to the amount of snow in the region. He said there were some problems with people parking outside of berms, which made clearing the streets more difficult. Also with residents throwing the snow in their yard back onto the street. The Westwood Community Services District put together a list of people who provided plowing service for community members that needed help moving all the snow on their property. Duerksen said people could call the district office for the phone numbers. He added that he did not have a list of volunteers who could help. When he was a child, organizations such as the Boy Scouts volunteered to shovel snow. In the future, he would like members of the Westwood Fire Explorers to help seniors and disabled residents shovel walkways and driveways after snowstorms. McGarva said with spring approaching he expects to reach the end of the season for plowing soon.